Esther Dora Griswold was born at Manchester, Hartford Co., CT. DAR member 47513. She was the daughter of Roger Merwin Griswold MD and Rebecca Eddy Norton. DAR record 54757. Sophronia Sumner was born in 1806. She was the daughter of William Sumner and Artemisa Spencer. Sophronia Sumner married Harlow Holliday Bushnell in 1830. Sophronia Sumner died in 1889. Harlow Holliday Bushnell was born in 1806. He married Sophronia Sumner, daughter of William Sumner and Artemisa Spencer, in 1830. Harlow Holliday Bushnell died in 1880. DAR record 54757. Ellen Sophronia Bushnell was born in 1832. She was the daughter of Harlow Holliday Bushnell and Sophronia Sumner. Ellen Sophronia Bushnell married Eustace William Hamilton in 1853. Eustace William Hamilton was born in 1824. He married Ellen Sophronia Bushnell, daughter of Harlow Holliday Bushnell and Sophronia Sumner, in 1853. Eustace William Hamilton died in 1905. Egens E. Hamilton was born at Berkshire Co., MA. She married an unknown person Arthur Loring Sikes. She was the daughter of Eustace William Hamilton and Ellen Sophronia Bushnell. DAR member 54757. [S116] Esther Griswold French and Robert Lewis French, Griswold, page 113. [S116] Esther Griswold French and Robert Lewis French, Griswold, page 114. Elizabeth Abel married Samuel Griswold, son of Samuel Griswold and Susannah Huntington, on 2 April 1719 at Norwich, New London Co, CT.
Jacob Griswold was born on 26 March 1691 at Wethersfield, Hartford Co., CT. He was the son of Jacob Griswold and Mary Wright. [S116] Esther Griswold French and Robert Lewis French, Griswold, Page 245/Item 24. [S116] Esther Griswold French and Robert Lewis French, Griswold, Page 234/Item 8. [S863] Thomas Owen Griswold, Reeve Griswold Family, page 54. [S863] Thomas Owen Griswold, Reeve Griswold Family, page 59. [S863] Thomas Owen Griswold, Reeve Griswold Family, page 61. [S116] Esther Griswold French and Robert Lewis French, Griswold, page 235. Michael Griswold died on 26 September 1684. [S116] Esther Griswold French and Robert Lewis French, Griswold, Page 229/Item 1. [S116] Esther Griswold French and Robert Lewis French, Griswold, Page 231. Deborah (?) married Joseph Griswold, son of Ensign Joseph Griswold and Mary Gaylord. Joshua Preserve Holcombe was born on 30 March 1778 at Granby, Hartford Co., CT.2 He was the son of Joshua P. Holcombe and Sarah Smith. Joshua Preserve Holcombe married Keziah Alderman, daughter of Elijah Alderman and Dorcas Alderman. Joshua Preserve Holcombe died in 1833. He was buried on 29 August 1833 at East Granby, Hartford Co., CT.
McPherson does not indicate which children go with which wife. Carol Laun of the Salmon Brook Historical Society provides Joshua's birth and burial dates from the East Granby Vital Records. Carol also checked the Census Records. In 1810 Joshua P. was 32, wife, probably Sarah Griffin, son 10-16, 3 sons under 10, 2 daughters under 10. In 1820 Joshua P. was 42, wife, probably Keziah Alderman 39, 2 sons 10-16, 1 daughter 16-20, 3 daughters under 10. In 1830 Joshua P. was 52, Keziah was 49, an older woman was living with them, 70-80, male 30-40, 2 males 20-30, 1 male 10-15, 2 females 15-20. [S25] Hannah McPherson, Holcombe Genealogy, Page 45.1/Item A-4-5-2-2-1-2. [S45] Albert C. Bates, Simsbury, Page 256. [S807] Find A Grave, online http://www.findagrave.com, memorial #115705426. George Carlton Holcombe was born at CT. He was the son of Joshua Preserve Holcombe. George Carlton Holcombe was baptized on 30 June 1800 at St. Andrews Episcopal Chruch, Simsbury, Hartford Co., CT. Carol Laun of the Salmon Brook Historical Society has probate records dated 1848 and census records indicating that George Carlton Holcombe may have died circa 1848. Larmon Holcombe was born in 1802 at CT. He was the son of Joshua Preserve Holcombe. Larmon Holcombe married Hilpah Freelove Griffin, daughter of Isaac Griffin and Freelove Warner. Larmon Holcombe died on 16 March 1863. 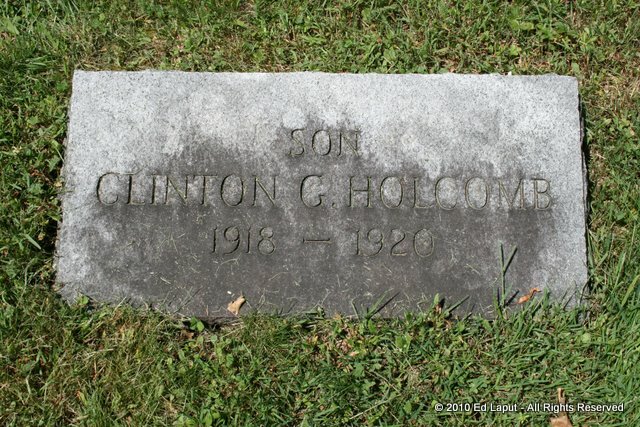 He was buried at West Mountain Cemetery, Suffield, Hartford Co., CT.
Information on the descendants of Larmon is from Wilbur C. Holcomb, 958 Copper Hill Rd., West Suffield, CT, 06093. Larmon and Hhilpah were enumerated in the 1850 Suffield, Hartford Co., CT, federal census. He was a farmer, age 48; she was 45. Children in the household were Lilis 22, and Clinton D. 14. Their two daughters who died young are buried with Larmon and Hilpah in Suffield. [S25] Hannah McPherson, Holcombe Genealogy, Page 45.1/Item A-4-5-2-2-1-2-2,. Hilpah Freelove Griffin was born in 1804 at CT. She was the daughter of Isaac Griffin and Freelove Warner. Hilpah Freelove Griffin married Larmon Holcombe, son of Joshua Preserve Holcombe. Hilpah Freelove Griffin died on 11 March 1876. She was buried at West Mountain Cemetery, Suffield, Hartford Co., CT.
Isaac Griffin married Freelove Warner. Isaac Griffin was born in 1776. He died in 1826. Freelove Warner married Isaac Griffin. Freelove Warner was born in 1776. She died in 1858. Lillis Holcombe was born circa 1827 at CT.1 She was the daughter of Larmon Holcombe and Hilpah Freelove Griffin. Lillis Holcombe married Miles Hayes. Lillis Holcombe died in 1913. MIles M. and Lillie F. were enumerated in the 1880 Suffield, Hartford Co., CT, federal census in the household of her brother Clinton. He was a farmer age 42, she was 52. Miles Hayes was born circa 1838.1 He married Lillis Holcombe, daughter of Larmon Holcombe and Hilpah Freelove Griffin. Miles Hayes died in 1880. Silas Holcombe was the son of Larmon Holcombe and Hilpah Freelove Griffin. Information on the descendants of Clinton DeWitt is from Wilbur C. Holcomb, 958 Copper Hill Rd., West Suffield, CT, 06093. Clinton was enumerated as head of the household in the 1870 Suffield, Hartford Co., CT, federal census. He was a farmer age 35. Also enumerated in the household were Horatio Griffin 61, Eliza 17, and Hilpah Holcomb, 66. A farm laborer, Mr. Miller age 36, was also enumerated. Clinton and Eliza were enumerated in the 1880 Suffield, Hartford Co., CT, federal census. He was a farmer, age 45, she was 30. The only child in the household was Ella A. 5. Also in the household was the family of sister Lillie. Clinton and Eliza were enumerated in the 1900 West Suffield Village, Suffield Twp., Hartford Co., CT, federal census. He was a farmer. Their ages are suspect. He was listed as 65, but that was crosses out and 55 was written above. His date of birth was given as Aug 1844. All other sources seem to agree with the age of 65. She was listed as 50, with birth date July 1849. Also enumerated in the household was daughter Ella A. 25, son-in-law Fred Lauzon 36, granddaughter Maud 3, grandson Raymond 2, son Wilbert 17, and son Roy 10. [S25] Hannah McPherson, Holcombe Genealogy, Page 45.1/Item A-4-5-2-2-1-2-2-3. Eliza Searles was born in July 1849 at CT.1,2 She married Clinton DeWitt Holcombe, son of Larmon Holcombe and Hilpah Freelove Griffin, circa 1872.2 Eliza Searles died in 1915. Ella and Frederick were enumerated in the 1900 West Suffield Village, Suffield Twp., Hartford Co., CT, federal census. He was a wood chopper, age 36, she was 25. The only child in the household was Raymond, 2. Ella and Frederick were enumerated in the 1920 West Suffield, Hartford Co., CT, federal census, ED 190, page 8A. They were in the household of her brother, Watson. [S182] Social Security Death Index (on-line), Ancestry.com, SSDI, Ancestry.com, SSAN 029-28-2451. [S419] Carol Laun, Beneath These Stones, Page 158. Watson Larmon Holcombe was born on 30 July 1880 at Hartland, Hartford Co., CT.2,3,4 He was the son of Clinton DeWitt Holcombe and Eliza Searles. Watson Larmon Holcombe married Mildred E. Clark circa 1921.4 Watson Larmon Holcombe died on 3 June 1959 at at his home, Suffield, Hartford Co., CT, at age 78. He was buried on 5 June 1959 at Center Cemetery, Granby, Hartford Co., CT.
Courant : Watson was a former member of the Suffield Board of Tax Review. He was a retired Dairy and tobacco farmer. A past master of St. Mark's lodge, AF&AM, of Granby, he was chaplain of the lodge for several years. He was a past patron of Day Star Chapter of the OES, Granby, and a member of the Copper Hill Methodist Church, East Granby. Watson was a census enumerator for the 1920 census of Suffield. In that census, he was enumerated on page 8A, as head of household, age 39. Brother Roy and sister Ella were enumerated with him. Watson and Mildred were enumerated in the 1930 Suffield, Hartford Co., CT, federal census, district 217. Brother Roy was in the household. Watson registered for the WWII draft while living on Copper Hill Rd., Suffield, Hartford Co., CT, and listed Mildred as his closest relative. [S161] Carol A. Laun, Granby Center Cemetery, Page 12. [S207] World War I Draft Registrations, Draft Cards unknown repository. Mildred E. Clark was born in 1897 at NJ. 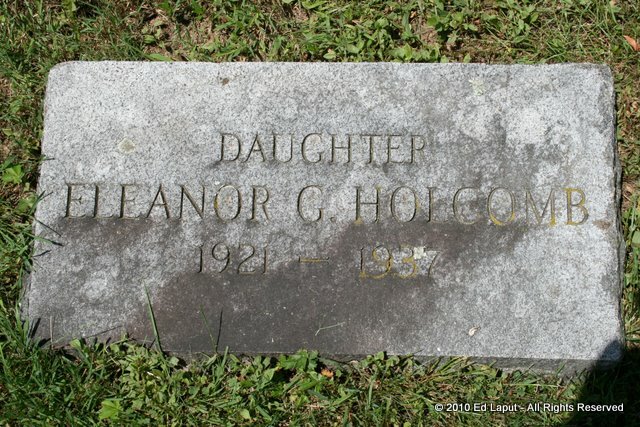 She married Watson Larmon Holcombe, son of Clinton DeWitt Holcombe and Eliza Searles, circa 1921.1 Mildred E. Clark died on 16 May 1981 at Avon, Hartford Co., CT.
Information on the descendants of Wilbur Harry is from Wilbur C. Holcomb, 958 Copper Hill Rd., West Suffield, CT, 06093. At the time of his registration for the WWI draft he was a farmer in Ganby. Wilbur and Georgia were enumerated in the 1920 West Suffield, Hartford Co., CT, federal census, ED 190, page 8A. He was a farmer, age 36, she was 37. Children in the household were Wilbur 5, and Clinton. Wilbur and Georgia were enumerated in the 1930 Suffield, Hartford Co., CT, federal census, district 217. He was a farmer age 47. Children in the household were Wilbur 15, and Eleanor 8. Wilbur registered for the WWII draft while living on Mountain Rd., Suffield, Hartford Co., CT, and was working for Burton K. Holcombe. 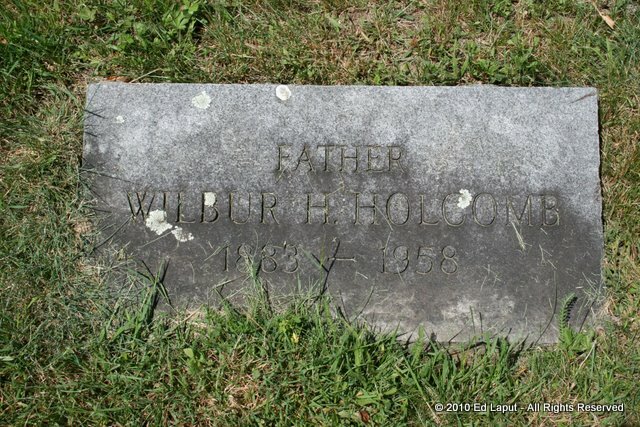 He listed Wilbur C. Holcomb as his closest relative. [S419] Carol Laun, Beneath These Stones, Page 157. Roy registered for the WWII draft while living in West Suffield, Hartford Co., CT, working for his brother Watson. [S182] Social Security Death Index (on-line), Ancestry.com, SSDI, Ancestry.com, SSAN 047-30-1176. Raymond Lauzon was born in December 1897.1 He was the son of Fredrick Lauzon and Ella Agusta Holcombe. 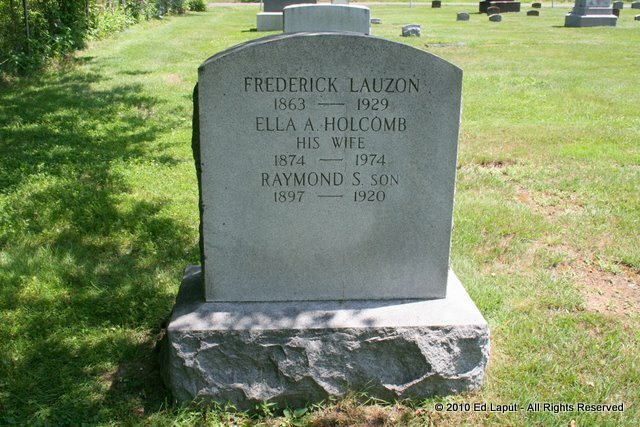 Raymond Lauzon was buried on 9 February 1920 at Copper Hill Cemetery, East Granby, Hartford Co., CT.2 Unmarried. William Chapin married Jenny MacIntosh. William Chapin was born in 1848. He died in 1931. Jenny MacIntosh married William Chapin. Jenny MacIntosh was born in 1848. She died in 1922. Wilbur Chapin Holcomb, 89, of West Suffield beloved husband of Louise (Hierl) Holcomb died Friday, (February 6, 2004) at St. Francis Hospital. Born in West Suffield son of the late Wilbur H. and Georgia (Chapin) Holcomb. He was a life long resident of West Suffield. Before retiring in 1979 he was a machinist at Pratt & Whitney and Hamilton Standard for many years. Wilbur was a member of the Copper Hill United Methodist Church and the Suffield Sportsmen Association. Besides his wife he leaves a daughter, Judith Holcomb of Windsor; a son and a daughter-in-law, Gerald and Laura Holcomb of Fitzwilliam, NH, and was predeceased by a son, Richard A. Holcomb. He leaves a daughter-in-law, Janie Holcomb of Fairport, NY; four grandchildren, Beth and her husband Robert Mulhern of Gates, NY, Richard and his wife Michele Holcomb of Farmington, NY, Rebecca and her husband Thomas Jarvis of Reading, PA, and Clinton Holcomb of Keene, NH; and eight great grandchildren. He was predeceased by a brother, Clinton Holcomb and a sister Eleanor Holcomb. The funeral will be held Tuesday, February 10, 1 p.m. at the Copper Hill United Methodist Church, East Granby with the Rev. Robert Sorozan officiating. Burial will be in Copper Hill Cemetery, East Granby. His family will receive friends TODAY, from 4-7 p.m at the Nicholson & Carmon Funeral Home, 443 East St., Suffield. Memorial donations may be made to the Copper Hill Methodist Church Building Fund, 27 Copper Hill Rd., East Granby 06026 or to the Suffield Volunteer Ambulance Association, P.O. Box 642, Suffield, 06078. [S182] Social Security Death Index (on-line), Ancestry.com, SSDI, Ancestry.com, SSAN 042-16-1093. [S284] Courant, February 9, 2004. John Hierl married Renske Janssen. John Hierl was born in 1872. He died in 1972. Renske Janssen married John Hierl. Renske Janssen was born in 1879. She died in 1954. Richard Alan Holcombe was born on 19 October 1942. 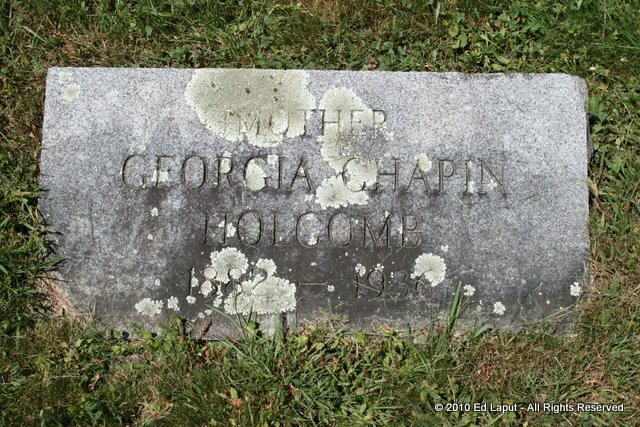 He was the son of Wilbur Chapin Holcombe and Louise Margaret Hierl. Richard Alan Holcombe died on 12 July 1993 at age 50.